Welcome to Sedgwick Research's site for the William and Hannah Day Webster Family! If you have any information or photographs of William, Hannah, or their family members that you would like to share, please contact us at postmaster@sedgwickresearch.com. Thank you very much!! A Brief Life History of William Webster: William, the immigrant ancestor, was the son of Thomas Webster and Mary Brent Webster. He married Hannah Day. More on the Life of William Webster: This is also a brief, but slightly more lengthy, history of William Webster. If anyone has more information or photographs of William and his family that they would like to share, please contact us at postmaster@sedgwickresearch.com. Life History of George Webster: George was also the son of William and Hannah Webster. George married Christiana Elliott, daughter of Luke and Henrietta Sarah Hill Elliott, in 1859. He and Christiana had two sons, George William, and John Alfred. After Christiana's death, George married Annie Latimer. 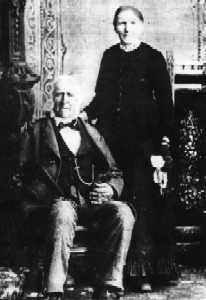 Life History of Levi Webster: Levi is the son of William and Hannah Webster. Life History of Agnes Higgs Webster: Agnes married Levi Webster. The Family of Levi and Agnes Webster: A more detailed history of Levi Webster and Agnes Higgs Webster that was given at a family reunion. Life History of Eliza Webster Flint: Eliza was the daughter of Levi and Agnes Webster. She married John Frederick "Fred" Flint. More on the Life of Eliza Webster Flint: A little more information about Eliza and her husband, Fred.